The FMA-5000 Series has been discontinued. Please see the FMA1700A_1800A Series as a possible alternative or contact our Flow Engineering Department. FMA-5000 Series Electronic Mass Flowmeters provide high performance, versatility and state of the art design in one compact package. The FMA-5000 Series measures the mass flowrate of gases in 13 ranges from 0 to 10 SCCM (Standard Cubic Centimeters per Minute), to 0 to 50 SLM (Standard Liters per Minute). For the complete listing of ranges, refer to the Flow Range Table on page D-28. Accuracy is 1.5% of full scale over a wide temperature and pressure range. Time response is 2 seconds to within 2% of final flow. 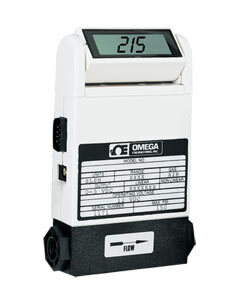 These unique flowmeters are available with or without digital display. An optional power supply can be purchased separately. A major application for the FMA-5600 is in the replacement of rotameters. Their analog output, integral/remote digital display, insensitivity to temperature and pressure variations and low cost make them ideal substitutes for rotameters. In fact, they can also be used to calibrate rotameters. Other applications include chemical and food processing, research and development, gas chromatography, and leak and filter testing, to name a few. Additional design features include a 31/2-digit LCD display (FMA-5600 Models) of the mass flowrates directly in SCCM or SLM. (Other gases available by special order.) The display is tiltable over 180° for easy viewing, and can be ordered with 25 feet of cable for remote surface mounting. The FMA-5600 and FMA-5700 Series require a 12 to 15 Vdc external power source provided by the Model FMA-PST Power Supply Accessory. A 0 to 5 Vdc (standard), or 4 to 20 mA (optional) output signal linearly proportional to gas mass flowrate is provided for recording, datalogging, or control. A 9-pin “D” subconnector for the output signal, input power, and remote display drive is supplied with its mating connector for all FMA-5000 Series units. All wetted surfaces are constructed of corrosion resistant glass-filled Nylon 66 plastic, 316SS, and FKM O-rings. † Flow ranges specified are for Nitrogen or Air. When used for other gases, a multiplication factor is used to determine the flowrate, and the digital display must be rescaled in the field. 참고: Comes complete with NIST traceable cert and operator's manual.